While cleaning up after opening presents this holiday season, take a moment to think about where this trash will go. 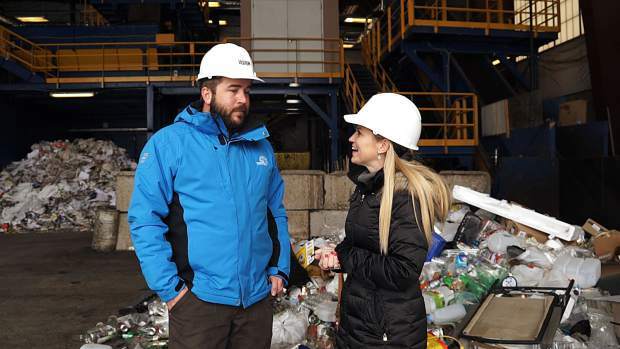 Mark Hoblitzell, environmental sustainability coordinator with the town of Vail, invited our crew to visit the Vail recycling collection area and learn where this trash goes after it is sent down valley. Just outside of Wolcott is the Eagle County Landfill. We toured the Materials Recovery Facility where recyclables are separated from each other in a highly technical manner. With the use of staff, optic, and magnetic mechanisms items are sorted into the correct bins. A “puff” of air blasts out plastics and a series of magnets pulls out the different metals. The goal is to have less than 10 percent contamination present in the final sorted and prepped product. The town of Vail passed a community wide recycling ordinance in 2014 requiring recycling by all residents, guests, and businesses. Hoblitzell said that the Town of Vail’s recycling rate is 27.8 percent, which is slightly above Eagle County’s recycling rate of 26.9 percent and well above Colorado’s recycling rate of 11 percent. But it still has some room to grow to reach or surpass the national recycling rate of 34 percent. Some of the biggest contaminants are film plastics, plastic bags, coffee cups and Styrofoam. Despite having a number, Styrofoam is not recyclable in our community. The town of Vail would like to remind that wrapping paper, tissue paper, ribbons, etc. are not recyclable and to not put them in recycling bins. Vail Honeywagon would also like to remind people to not throw their Christmas trees in the trash. They have a plan for gathering trees curbside and at drop off sites. People can visit http://www.lovevail.org to learn about town recycling and other sustainability efforts. Walking Mountains offers free tours of the Eagle County Recycling facility and Household Hazardous Waste Facility. The next tour is in February.